Harry Styles Has A Fail Moment At The 2014 Brit Awards! – Check It Out! Earlier this week on Wednesday, Feb. 19, 2014, One Direction attended the 2014 Brit Awards where they were up for some nominees and ended up taking home two awards! The guys of One Direction won the Best British Video for Best Song Ever and even won the Global Success Award! 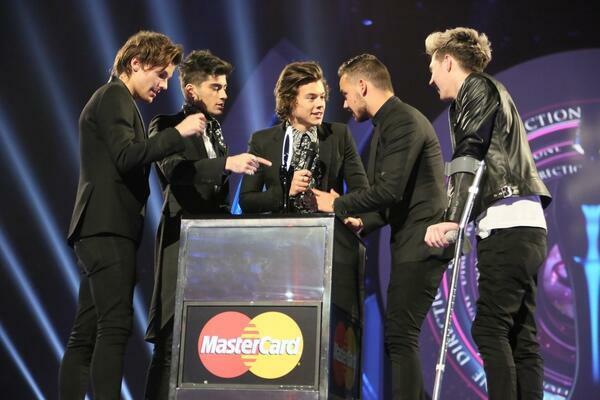 When their win was announced, Liam, Zayn, Louis and Niall all went up to stage but there was one person missing – Harry! One Direction took the stage without Harry who was M.I.A! So where was he? It seems like Harry had to use the restroom during the award show which made him almost miss the group getting their Global Success award. Harry ran to stage to join his fellow band members and he even shares his excuse for being late on stage. Check out the video below of Harry running to the stage and let us know what you think by commenting! One Direction Talks BRIT Award Wins, Fans & Niall Horan Raps! – Check It Out Here! During the 2014 BRIT Awards that took place last night, the guys from One Direction took home some well-deserved awards! After the awards night, the guys talked about the awards they won, thanked their fans and One Direction member, Niall Horan, even showed off his rapping skills while on the red carpet. Niall was also on his crutches after having knee surgery but he pulled through to be there with his fellow band members. Check out Niall Horan rapping by watching the video below and let us know what YOU think by commenting! 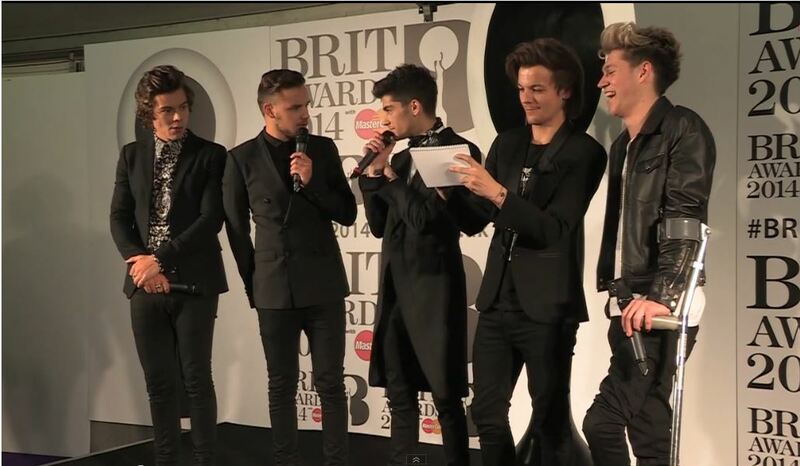 One Direction Takes Home Two BRIT Awards From The 2014 BRIT Awards! 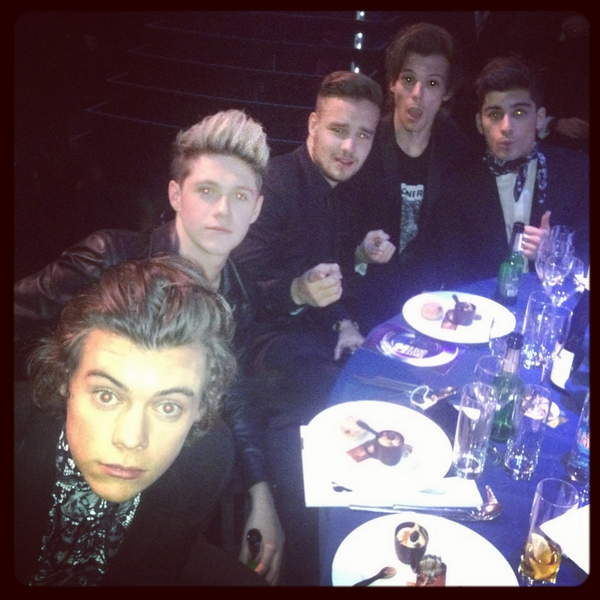 The 2014 BRIT Awards took place last night and the boys from One Direction were up for some nominees! The fans showed their love and support for the guys and they were able to take home two awards last night! Thank you to everyone who voted.. Brits are ace. Can't thank everyone who voted enough 🙂 had a great night last night ! Congratulations! We are super excited to see what else One Direction has in store for the future! Be sure to also check out One Direction accepting their award in the video below! Katy Perry Performs ‘Dark Horse’ At The 2014 BRIT Awards! – Watch Now! The 2014 BRIT Awards took place last night and Katy Perry was among the many performers to take the stage! The pop singer performed her latest single Dark Horse! Of course, her performance of the song during the Grammy Awards was much different compared to the one during the BRIT Awards. Recently, Katy shared her a preview of her music video for Dark Horse and it had more of an Egyptian theme to it and that is exactly what her inspired theme for her performance was – with lots of vibrant and neon colors! Check out Katy’s performance from the 2014 BRIT Awards in the video below and be sure to catch Katy’s official music video for Dark Horse by clicking here! One Direction has been nominated for two awards at the Brit Awards! The Brit Awards are the British Phonographic Industry’s annual pop music awards, and the British equivalent of the American Grammy Awards. Previously, One Direction was able to take home a Brit Award for Best British Single of the Year which was for What Make You Beautiful. 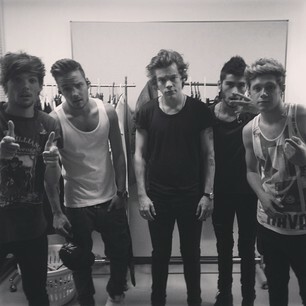 This year, the boys of One Direction are up to win an award for Best British Group and Best British Single Of The Year. The Brit Awards will take place live on Wednesday, February 19th at 8 PM.